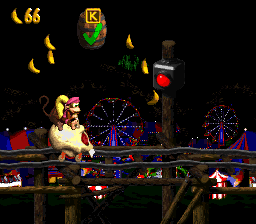 Krazy Kremland is the fourth world of Donkey Kong Country 2: Diddy's Kong Quest and the third world of Donkey Kong Land 2. It is a run-down amusement park belonging to the Kremlings, built upon a swamp. The world boss is a large Zinger named King Zing. After completing the Lost World in either game, the entirety of Crocodile Isle, along with Krazy Kremland, sinks into the ocean. Krazy Kremland is located in the middle section of Crocodile Isle, above the swampy piers of Krem Quay and below the forests of Gloomy Gulch. The amusement park is large, and poorly maintained, as shown from a couple of large Zinger hives sitting outside the entrance and exit to the amusement park itself. The amusement park itself is simply titled "Kremland", as shown from a sign held by a Klomp. These beehives each serve as the first and final level. Before trekking through the second series of Zinger hives, Diddy and Dixie Kong must go through a swamp area. The amusement park itself mainly consists of unsafe roller coaster rides, as several of the track segments are missing. A large statue of a Kannon and Kruncha are shown within the park, as well as a large ferris wheel, carnival tents, a High striker, and an arcade. The second and fourth levels consist of roller coaster rides themselves, and the third level takes place within a massive bramble infestation standing between the two levels. The Monkey Museum is located at arcade area region, which has a sign advertising "KI HERE" (an abbreviation of Killer Instinct) outside its tent. Two Killer Instinct cabinets are located outside the tent while a couple of more appear under the tent itself. In Donkey Kong Land 2, Krazy Kremland was redesigned to have a simpler appearance. 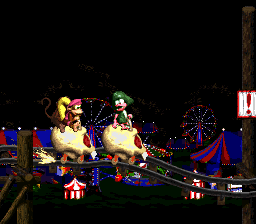 The map retains the usual beehives, roller coaster, and brambles and also features a tent and ferris wheel in the top-right scenery. In the Game Boy Advance port, as with other worlds, the world map for Krazy Kremland was redesigned. The formal entrance into the amusement area was removed, and most of the amusement features were removed. There are only a few tents and a rollercoaster built upon thin logs, all of which appear on the upper region of the world map. The Kremland sign was changed to hang from a large, gray mountain. The bramble area is still located at the top-left corner like with its previous appearances. There are six levels and a boss level in Donkey Kong Country 2. The level names are mostly the same between it and Donkey Kong Land 2. 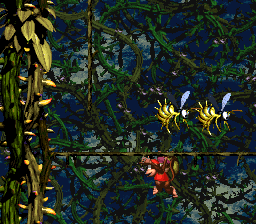 Although in the latter title, Bramble Blast was relocated in the world in Bramble Scramble's place, which itself was relocated between Rickety Race and Mudhole Marsh. This increased the total number of regular levels to seven. 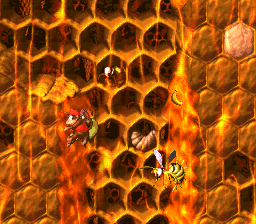 Hornet Hole Hornet Hole in Donkey Kong Land 2 is similar to its DKC2 namesake, where Diddy and Dixie will have to get through a hive with Zingers and Spinys to be wary of, and climb up walls with honey. Squitter also makes an appearance in the level, where he can use a web spit attack to defeat Zingers with ease, or make web platforms. Target Terror Target Terror entails Diddy and Dixie getting on a Skull Cart and riding the cart on the track, jumping over gaps in the track and colliding into Check Barrels to open up the pathway. They must be careful and avoid X Barrels, for breaking an X Barrel will block the path and cause a Kong to be injured. Bramble Blast Bramble Blast was moved to Krazy Kremland in DKL2 due to the abundance of levels in Krem Cauldron upon the merging of Krem Quay and Crocodile Cauldron. The level takes the place of Bramble Scramble, which was moved to be between Rickety Race and Mudhole Marsh. In Bramble Blast, the heroes must progress in the stage by getting launched out of barrel cannons. There are some alternative paths in the stage that lead to bonus areas and items. Rickety Race Rickety Race has Diddy and Dixie hopping onto a Skull Cart and competing against ten Klanks for first place in a race on the roller coaster track. The track dips and has various holes in the path, which means that the heroes must be cautious as they try to overtake enemy Kremlings on the track. The prize for coming in first is a DK Coin. Finishing first is not required to complete the level itself. Bramble Scramble Bramble Scramble features Squawks the Parrot as the prominently playable Animal Buddy. He must fly through a thicket of bramble plants while defeating or evading Zingers, Krooks, and Flitters. When Squawks isn't being used, the level has vine climbing segments where the level sometimes becomes maze-like. 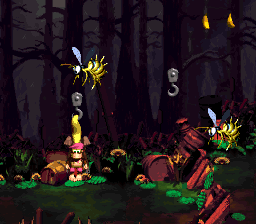 Mudhole Marsh Given the absence of Cat-o'-9-tails and Kannon enemies that fire wooden barrels to jump off of, Mudhole Marsh in DKL2 is very similar to the previous swamp level, Krockhead Klamber. Diddy and Dixie must get to the other side of the swap with the help of Krockheads, climbing on cattail plants, and leaping off Flitters and Mini Neckys. 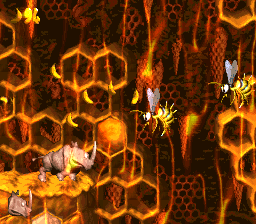 Rambi Rumble Rambi Rumble in Donkey Kong Land 2 is a straightforward beehive stage where King Zing ends up not making an appearance due to hardware limitations of the Game Boy. 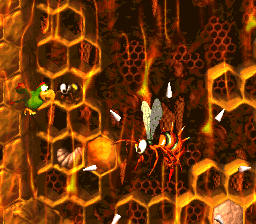 The first half of the level is similar to Hornet hole, where honey coated floors and walls are recurring throughout, and the latter half features Rambi, where there are a variety of enemies in place of King Zing's absence. Boss level: King Zing Sting King Zing is the boss of the area, and Squawks is used to fight him. Upon being hitting King Zing in his normal state, he will try to ram into Squawks for a short amount of time before returning to flying in the area in a pattern. Beyond damaging him a few times, he will summon Zingers behind him as he flies to cover his trail. Each time he is hit, he flies a bit faster. Hachimitsu pāku "Kuremurando" Honey Park "Kremland"
This page was last edited on April 16, 2019, at 21:29.